July 22, 2014 - An IDF soldier is missing following a deadly battle which saw six soldiers killed Sunday in an attack on an armored personnel carrier in Gaza, the IDF said. The missing soldier has been named as Sgt. Oron Shaul, 21, from the Golani Brigade. Six of his fellow comrades were killed in the incident and the assumption is that he also died in the attack. ne of the fallen soldiers from Monday was identified as Sergeant First Class Oded Ben Sira, a 22-year-old infantry soldier from Nir Etzion, who died Monday afternoon in a run in with Gaza terrorists. He was posthumously promoted to the rank of Sergeant First Class. His funeral will be held at 5pm Tuesday at the Nir Etzion' cemetery. 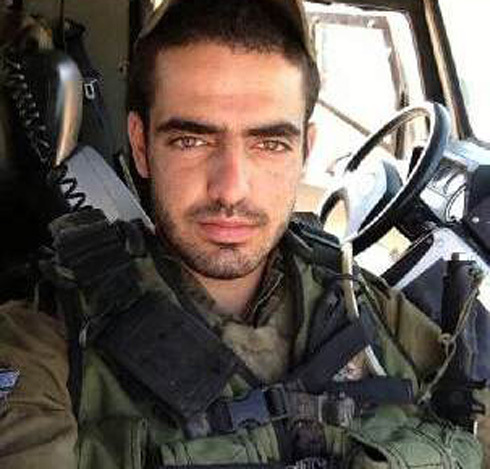 The second soldier killed Monday was Private First Class Ehud Shemesh, (pictured above) 27-years-old from Beit Elazari, his funeral is scheduled for 5 pm on Tuesday at the military section of the Mazkeret Batya cemetery. St.-Sgt. Evyatar Turgeman, 20, from Beit She'an, was killed on Tuesday morning in a firefight with terrorists in Gaza. Turgeman served in the Paratroopers Brigade. Overnight Monday, three soldiers were severely wounded and four sustained light injuries in military activity in the area of the Strip. Several soldiers were injured, including two critically in a grenade explosion near Magen Junction, in the Eshkol Regional Council overnight Monday. Twenty seven officers and soldiers have been killed since the beginning of the operation. Among the wounded was the commander of the elite Egoz unit, who was seriously wounded in fighting Monday morning in the Gaza Strip. He is currently hospitalized in Be'er Sheva's Soroka Medical Center. The Egoz unit was involved in massive fighting Monday in Gaza's Sejaya area. The forces reportedly killed 10 terrorists, one of which was armed with a sucide belt.